Michael Gove has warned of the rise of identity politics in Britain, but insisted the Brexit campaign which he helped lead did not fan its flames. The Tory minister said elements on the left and right wanted to pit groups against each other in a “conflict for recognition, rights and resources”. But he rejected claims Leave voters were also examples of “identitarians”. He told an event in London that Brexit was motivated by a desire to “restore faith in our democratic institutions”. Addressing a conference on the future of the United Kingdom, the environment secretary said the tendency to look at “political questions through the prism of identity” posed a challenge not just to the constitutional order which he said had, for the most part, served the UK so well for hundreds of years but to the concept of individual rights. “The identitarians want to move away from the liberal principles of equal treatment for all, colour blindness and respect for individual rights,” he told the event, hosted by the Policy Exchange think tank. On the left of politics, he said this was characterised by an “insistence that an individual should check their privilege before speaking and pipe down if they don’t fit in or avoid cultural appropriation – in other words know their place in the world if they want to get a hearing”. Despite the “effective eclipse of UKIP” as a political force, he said the manifestation of identity politics on the right of the political spectrum in the UK and further afield was “equally concerning”. “You hear it when there is an appeal to defend men’s rights which is an attempt to make gender a cause of conflict, not an aspect of character,” he said. In contrast, he said unionism as a political tradition, while needing to be rejuvenated and kept relevant, was underpinned by principles and institutions which offered a “warm home” to “so many from a distinct and diverse background”. Through its allegiances to “Magna Cartas, Bills of Rights, Great Reform Acts and Golden Jubilees, not tribal, cultural, sexual and divisive totems” – unionism stood in direct opposition to identity politics, he added. Accusing the SNP of “playing with” identity politics for its own electoral benefit and using Brexit as just one of many “grievances”, he said Scottish nationalism “conflates truly progressive politics with superior virtue that can apparently only really come from living north of the border”. But Mr Gove came under fire from former Conservative MP and Lib Dem MSP Keith Raffan who said the Brexit vote, opposed by 62% of those who voted in Scotland, had put a “totally avoidable” strain on the union, as demonstrated by the Scottish Parliament’s recent refusal to give its consent to the EU Withdrawal Bill. Vote Leave’s campaign claims about Turkish immigration were “far worse” than anything the SNP had ever come up with, he suggested. 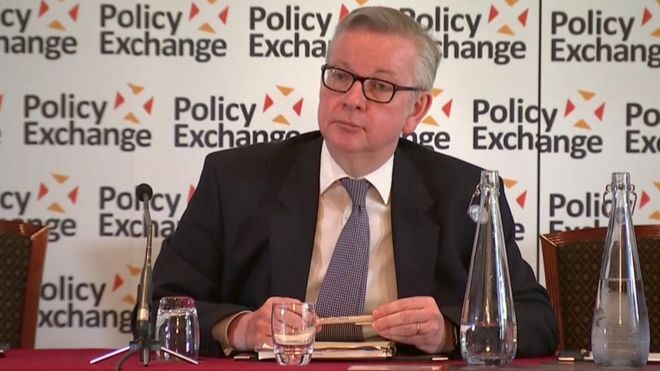 “Haven’t you played with identity politics when the Leave campaign stated that 80 million Turks could decamp to England – dog-whistle politics of the nastiest kind,” he asked Mr Gove. The environment secretary, who is Scottish, said he “respectfully disagreed” with claims the Brexit vote was driven by xenophobia or a nostalgia for a return to the the time when Britain was an imperial power. “People wanted to make sure they had control of their borders, of our taxes, of our laws and all of that was part of a broad campaign to restore faith in our democratic institutions,” he said. Asked directly whether Leave supporters were identitarians, Mr Gove said the “answer to that question is no”. Speaking at the same event, Conservative Party chairman Brandon Lewis said English identity should be celebrated more openly as part of the UK projecting an “outward-looking” face to the world after Brexit. But former Labour cabinet minister Jim Murphy said that while he remained a passionate believer in the union, he feared David Cameron’s efforts to make the Conservatives a truly national party had “dissipated” in favour of them embracing a narrower English nationalism. And the SNP’s Pete Wishart poured scorn on the whole idea of an “unionism convention” as well as Mr Gove’s claim that the UK had become “more welcoming” to immigrants since the Brexit vote.